A dedication ceremony was held Thursday for the Buckeye Lake Dam project. Governor John Kasich cut the ribbon on the rebuild that was completed nearly two years early and more than 40 million dollars below the projected cost. The U.S Amy Corps of Engineers released a report in March of 2015 that detailed the threat Buckeye lake dam posed to the community due to its deteriorated condition. The Governor told the Ohio Department of Natural Resources to replace the dam and with the help of the Ohio General Assembly they announced plans to rebuild the almost 200 year old, 4.1 mile earthen dam. 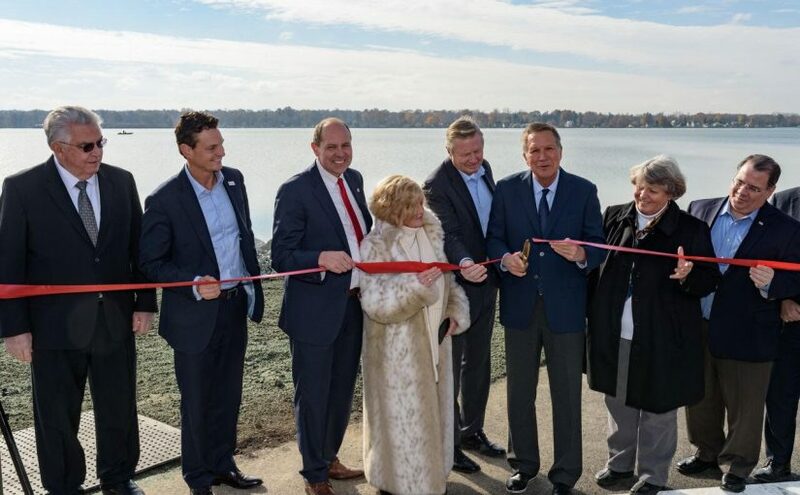 “The safety of high-risk dams in Ohio has been a priority for my administration, and the dam at Buckeye Lake State Park has for decades been recognized as the most in need of rebuilding,” said Kasich.